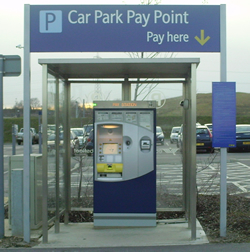 Ebbsfleet International station provide pay point machines located inside and around the car park to collect payment by using a parking ticket. Tips to speed up your trip and get you ahead of any delays in your journey. It is unnecessary to book parking in advanced, as at Ebbsfleet International railway station they have over 5000 spaces available for customers. Generally spaces are easy to find for parking. Payment types are Cash/ Debit Cards or Credit Cards. When you enter Ebbsfleet International station car park, you will see this machine (pictured left). Press the green button and it will provide you a new parking ticket, take the ticket and the barrier will open. Remember to keep your ticket somewhere safe as you will need it to pay, when you leave. 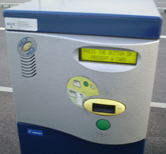 You can also use a season parking ticket or pass, inserted into the front of the machine. Pre-pay Seasonal Parking is available at Ebbsfleet International. PLEASE NOTE: We cannot reserve any specific parking spaces. This system only allows parking pre-payment. NCP are the ticket authority, click here to book parking online.